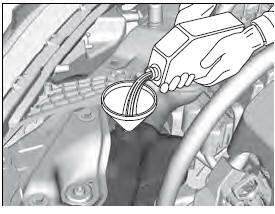 We recommend you check the engine coolant level every time you refuel. Check the reserve tank first. If it is completely empty, also check the coolant level in the radiator. Add the engine coolant accordingly. If temperatures consistently below −22°F (−30°C) are expected, the coolant mixture should be changed to a higher concentration. Consult a dealer for more information. If Honda antifreeze/coolant is not available, you may use another major brand non-silicate coolant as a temporary replacement. Check that it is a high quality coolant recommended for aluminum engines. Do not add rust inhibitors or other additives to your vehicle's coolant system. They may not be compatible with the coolant or with the engine components. 2. 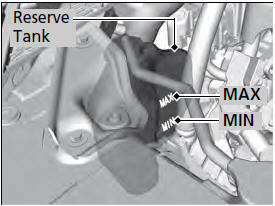 Turn the radiator cap counterclockwise and relieve any pressure in the coolant system. 3. 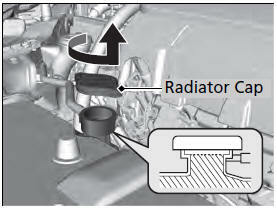 Push down and turn the radiator cap counterclockwise to remove it. 6. Pour coolant into the reserve tank until it reaches the MAX mark. Put the cap back on the reserve tank.